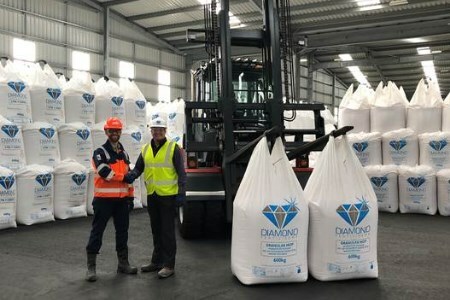 ABP has announced that it is investing £1 million to further improve the UK’s largest agribulk terminal at the Port of Immingham, the UK’s largest port. Immingham Bulk Park, which spans an area of more than 1.5 million ft2, already has the capacity to handle 1 million t of cargo each year and is home to ABP’s long-standing customers, Thomas Bell & Sons Ltd. It provides a vital service to farmers across the Midlands and North of England in keeping them supplied with fertilisers and animal feeds. Thomas Bell & Sons has recently signed a new five year agreement with the port operator, which will guarantee an additional 80 000 t of fertilizer being brought through the port each year. In 2016, ABP and Thomas Bell & Sons jointly invested £500 000 to build a bespoke blending facility at the Immingham Bulk Park. With national reach, this now enables the farming community to request specific blends of fertilizer, bespoke to their requirements.